I'm loving the images posted by the New York Times of President Obama's visit to Moneygall, Ireland, ancestral home on his mother's side. Located in central Ireland, Moneygall is a slightly bigger version of my own mother's ancestral home in Annascaul near Dingle in County Kerry. Here's a shot of POTUS and FLOTUS having a sip. 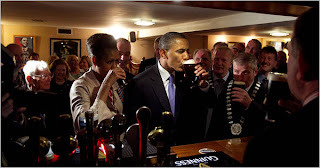 Is it fun to see that Obama has Irish roots?